The Kavli Prizes in astrophysics, nanoscience and neuroscience will be announced on May 28 by the Norwegian Academy of Science and Letters in Oslo, Norway. The Kavli Prizes recognize scientists for their seminal advances in three research areas: astrophysics, nanoscience and neuroscience. Independent of The Kavli Foundation, Kavli Prize recipients are chosen by three prize committees comprised of distinguished international scientists recommended by the Chinese Academy of Sciences, the French Academy of Sciences, the Max Planck Society (Germany), the National Academy of Sciences (US) and The Royal Society (UK). Consisting of a scroll, medal and cash award of USD one million dollars, a prize in each of these areas is awarded every two years at a ceremony in Olso, Norway. For more information about the Kavli Prizes, click here. Last year, seventeen prominent researchers gathered in Ilulissat, Greenland -- a town where dogsleds are common and townspeople sail in a fjord filled with enormous icebergs. The unlikely location was trumped only by the topic that brought them together: "The merging of bio and nano: towards cyborg cells." With specialties ranging from single molecule physics to systems biology, these scientists arrived to discuss what would happen as nanoscience and biology blended together at the level of cells and molecules. Perhaps most intriguing, could it lead to the creation of cyber-life? These and related questions were at heart of the first Kavli Futures Symposia which are dedicated to topics of emerging importance in the fields of astrophysics, nanoscience and neuroscience. "The Kavli Futures Symposia aim is to address key issues facing future developments and directions in specific fields, in part by defining and guiding the development of research in these fields," explains Dave Auston, the foundation's president. The Symposia do this by providing the framework, guidance and part of the resources for the Kavli Institutes to collaboratively identify and lead important dialogues in their fields. Proposing the first topic were two scientists on different continents. On one side of the Atlantic was Cees Dekker -- a biophysics professor with the Kavli Institute of Nanoscience at Delft University of Technology. On the other side of the ocean was Paul McEuen, physics professor associated with the Kavli Institute at Cornell for Nanoscale Science. Together, they developed, organized and then participated in a dialogue that proved memorable not only for the depth of the discussions, but for a conclusion that surprised many with an unanimous statement outlining "a vision for the convergence of synthetic biology and nanotechnology." Read more. 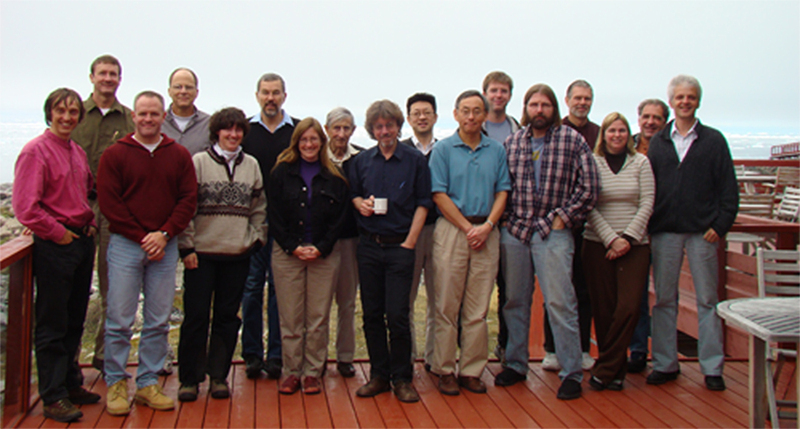 The final report on the 2007 Kavli Futures Symposium is now available on The Kavli Foundation website. Read report. The Gamma Ray Large Area Space Telescope (GLAST), due for launch in 2008, will give astronomers an unprecedented view of black holes, pulsars and possibly dark matter. But will it provide answers to some of the key questions facing astrophysics, such as what causes the massive jets of energy emerging from suspected black holes? Or why do pulsars have such strong magnetic fields? And perhaps most intriguing: is there a dark-matter particle, as some theorize? GLAST is a project of worldwide scope. Its scientific team includes more than 300 researchers, engineers, technical experts and graduate students representing 34 academic and government institutions in the U.S., Europe and Japan. And one key partners of this international effort is the Kavli Institute for Particle Astrophysics and Cosmology at Stanford University. Read more. The human cerebral cortex is strikingly similar to that of mice and monkeys, which all share the same basic building blocks (neurons) and have a similar six-layer structure. So aside from size, what is unique to the human cerebral cortex that makes it the primary location of human thought, including the ability to form ideas and feelings into words? Studying and uncovering the differences is one of the central research initiatives of the Kavli Institute for Neuroscience at Yale University. Scientists are looking at the genetic makeup and embryonic development of the cortex in mice, monkeys and humans to see when distinctly human traits appear and which genes produce them. In the process, they are seeking to answer a question that has occupied linguists, psychologists and philosophers for centuries and has now been taken up by neurobiologists: What makes us human? Read more. The South Pole is a frigid, dry and isolated corner of the world... and also thanks to the 10-meter microwave South Pole Telescope (SPT), a place where scientists can now survey the faint cosmic microwave background (CMB) radiation left over from the Big Bang. By gathering this critical new information, scientists can deepen our understanding of the birth, evolution and eventual fate of the universe. This includes deepening our understanding of dark energy - a mysterious force that works against gravity, is stronger than anything else on large scales and appears to have sped up the expansion of the universe. Is dark energy gaining strength only to one day end the universe by pulling all matter apart -- even atomic nuclei? Or will it weaken and allow gravity to re-pack the universe, in a so-called "big crunch." In short, how will dark energy determine the fate of our universe? Looking for answers is the SPT project, led by researchers at the Kavli Institute for Cosmological Physics, University of Chicago. Read more. Kavli Futures Symposium -- Are Cyborg Cells Coming? Yale University: What Makes Us "Human?" The Kavli Foundation is making available to educators four science videos about the frontiers of astrophysics, nanoscience and neuroscience. Available on DVD for use in classrooms at no charge to universities and high schools, each video is narrated by Alan Alda and takes viewers into distinctive, visual journeys that convey the challenges and promise of these fields -- among the most exciting of the 21st century. To view videos, click here. If you are interested in receiving the DVD for a university or high school, please submit a request to: info@kavlifoundation.org. California Institute of Technology. Hirosi Ooguri, the Kavli Professor of Theoretical Physics at the California Institute of Technology, has been named a co-recipient of the first ever Leonard Eisenbud Prize for Mathematics and Physics, awarded by the American Mathematical Society (AMS). The prize, created in 2006, has gone to Ooguri and co-authors Andrew Strominger and Cumrun Vafa of Harvard University for their paper "Black hole attractors and the topological string," published in 2004. Kavli Science Journalism Workshops at M.I.T. Philip J. Hilts has been named the new director of the M.I.T. Knight Science Journalism Fellowships program, which hosts the Kavli Science Journalism Workshops dedicated to astrophysics, nanoscience and neuroscience. Hilts is the author of six books and a prize-winning health and science reporter for both The New York Times and The Washington Post. He will succeed Boyce Rensberger, who retires this summer after ten years as the program's director. Kavli Institute for Brain Science at Columbia University. In fall 2007, Eric Kandel, director of the Kavli Institute for Brain Science at Columbia University, was a recipient of the National Academies 2007 Communication Award for best book. Kandel received the award as author of 'In Search of Memory: The Emergence of a New Science of Mind,' a personal memoir that is also an examination of the science of memory. Kavli Institute for Particle Astrophysics and Cosmology at Stanford University. KIPAC researcher Steve Allen has been awarded a share of the 2008 Rossi Prize by the High Energy Astrophysics Division of the American Astronomical Society (AAS). Kavli Institute for Bionano Science and Technology at Harvard University. In the January-February issue of Materials Today, one of the lead publications in materials science and technology, the development of soft lithography by Institute director George Whitesides is listed among "The Top Ten Advances in Materials Science." Kavli Institute of Nanoscience at Delft University of Technology. In 2007, the Netherlands Organization for Scientific Research (NWO) announced Leo Kouwenhoven as one the NWO-Spinoza Prize winners for 2007 -- the most prominent Dutch award in science. Also Nynke Dekker was awarded a European Young Investigators Award (EURYI award) for her research into molecular motors handling DNA and RNA. In December, the Chicago Tribune published a feature story about the Kavli Institute for Cosmological Physics, University of Chicago and the recently commissioned South Pole Telescope project. Read article... On National Public Radio's "Talk of the Nation, Science Friday," Chicago's Kavli Institute Director John Carlstrom discussed his hopes for what the telescope will show him - and what it's like to live and work in the frigid world of the southernmost continent. Hear report.